Medecins Sans Frontieres (MSF) does not provide GPS coordinates of health facilities it supports in Syria to either Damascus or Moscow over fears of “deliberate” attacks, the medical charity said, blaming a recent strike on “probably” Syrian or Russian forces. “We gave to the Russian ambassadors in Paris [and] in Geneva coordinates for three hospitals located in very intense conflict zones, but not for all of them, and it was a decision taken together with the medical staff of the health facilities that we support,” said MSF operations director Isabelle Defourny. At least 25 people were killed, including nine medical personnel and 16 patients, when airstrikes destroyed a hospital supported by MSF. Ten others were wounded when four missiles reportedly struck the hospital initially at around 9:00am local time Monday, according to accounts provided by medical staff on site. 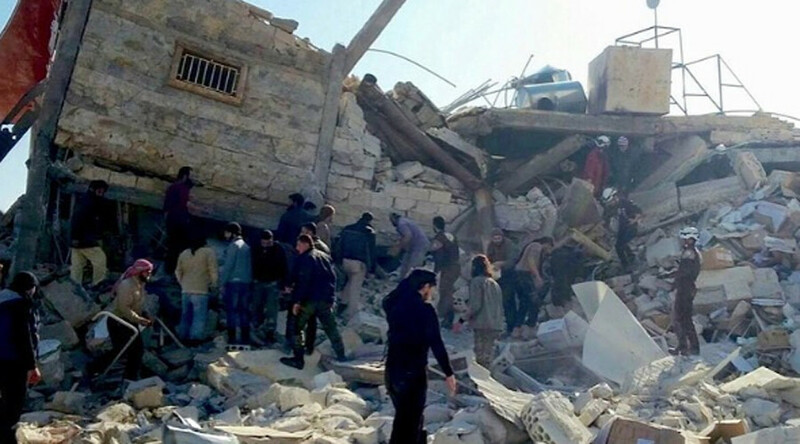 Forty minutes later, after rescuers arrived, the hospital was allegedly bombed again. According to MSF, the coordinates had not been shared with the authorities or relevant Russian representatives because of safety concerns that were voiced by doctors operating in Syria. “The staff of the hospital [and] the director of the hospital didn't know if they would be better protected if they give the GPS or not,” Defourny said. The operations director also noted, citing a deadly US airstrike in October on an MSF hospital in Kunduz, Afghanistan, that even offering GPS location would not serve as a safety guarantee. But now, after the latest strikes, the charity seeks to remedy the situation and expects its affiliated medical staffers to share their coordinates with the Syrian government officials. The NGO seeks an independent investigation into the strikes, but has already accused the Russian air force and the Syrian Army of “probably” hitting the Maaret al-Numan hospital, yet at the same time acknowledging that it has no evidence into their assertion. “We say a probability because we don’t have more facts than the accounts from our staff,” said Dr. Joanne Liu, MSF’s international president. "Unclear to us whether it was the Russian aircraft, Syrian aircraft or a Russian missile or a Syrian missile, that part at this point is a little bit unclear to us,” Warren said on Wednesday. “It is important to note that there were no coalition strikes in that area and in fact there have been no coalition strikes in Aleppo this year,” he added, contradicting the information shared by the Russian defense ministry last week. While the Syrian ambassador said Damascus has “intelligence information” that showed US warplanes had struck the hospital, the Russian presidential spokesman met allegations that the Russian Air Force delivered the strike with a flat denial, urging detractors to provide proof of the “empty” and “unfounded” accusations. “We vehemently reject such allegations, particularly because those making those statements have always proven to be unable to deliver any proof of their unfounded accusations,” Kremlin spokesman Dmitry Peskov said. MSF says that attacks against civilian infrastructure and hospitals became “routine”, saying that 101 shelling attacks have hit some 70 MSF-supported facilities over the last 13 months in Syria. At the same time, the MSF noted that it never received official permission from Damascus to carry out work in Syria and operates mainly in areas held by anti-government forces. The NGO president also noted the dire situation on the Turkish border, where Ankara continues its cross-border shelling of the Syrian Kurds gaining more ground.